DVD Synopsis: From Brett Morgan, director of The Kid stays in the Picture, comes a highly stylized and wildly original documentary film chronicling the real-life events surrounding the anti-war protest of the 1968 Democratic National Convention held in Chicago, and the charismatic protest organizers brought to trial by that city. Told through a visually arresting animation style and a bold use of archival footage and music, Chicago 10 channels yesterday’s voices for peace in a manner that speaks peace for today. I’d seen this movie back in 2008 and was very impressed with it, so much so that it made my top 10 list that year, coming in somewhere around #9. After watching it again, I wished I had ranked it much higher. 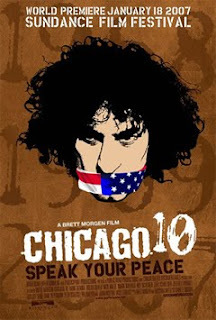 Chicago 10 is an entirely unique experience, combining top-notch animation with archival footage to bring the viewer back to 1968, when hippies, yippies, and anti-war activists clashed with police on the streets of Chicago during the Democratic National Convention. The live-action images of the protests and subsequent riots are very powerful, while the animation, which documents the ensuing trial of the protest organizers, is lighter, quite often humorous (an amazing fact when you consider that everything we see was lifted directly from that trial’s transcripts). Either of these segments could have been a film in its own right, but not nearly as good a film as Chicago 10, which skillfully blends both into a satisfying, challenging whole.